A welcome feature set announcement from MOTU this morning as they introduce wireless control of their Cuemix client from your iPad. If you own already own a CueMix-equipped MOTU audio interface you can now grab a free download from MOTU where the the latest CueMix FX software includes TouchOSC templates for your iPad. These will give you access too and complete control over the CueMix mixing and effects processing in your MOTU audio interface. Control your mix from anywhere in your home or studio via its Wi-Fi network. All CueMix-equipped MOTU interfaces are supported, both current and legacy models (see list below). 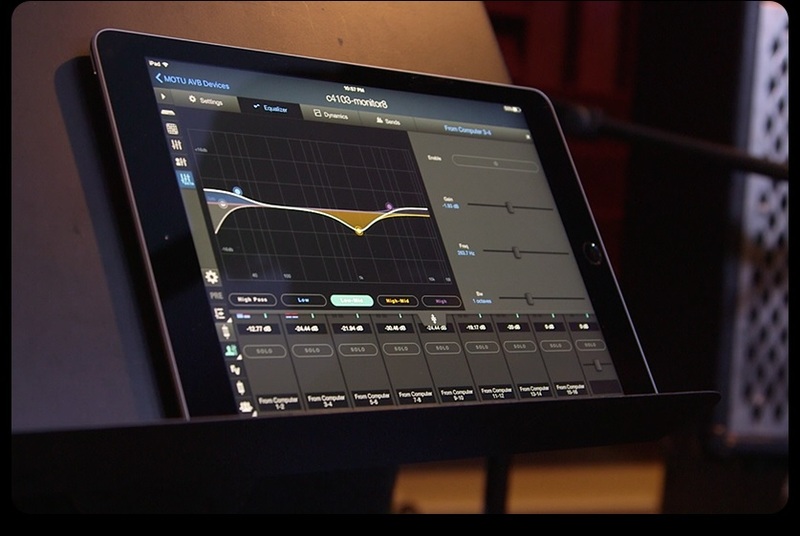 The CueMix mixer in your MOTU audio interface can be controlled from an iPad using an iPad app called TouchOSC. From your iPad, you can perform all CueMix mixing functions using the on-screen faders, knobs, and buttons in TouchOSC. Communication is bi-directional, so any changes you make on your computer screen will also be reflected on your iPad. So how does wireless control of CueMix from your iPad work? The CueMix FX (or CueMix DSP) mixer in your MOTU audio interface hardware is controlled by the CueMix FX software running on your computer. The CueMix FX software is, in turn, controlled by TouchOSC running on your iPad, which communicates wirelessly with your computer. Open Sound Control (OSC) is a protocol for communication among computers, sound synthesizers, and other multimedia devices that is optimized for modern networking technology. TouchOSC is a customizable OSC and MIDI control surface app for the iPad. It is available through the Apple App Store and allows you to control applications on your Mac or PC over Wi-Fi. MOTU has created custom TouchOSC iPad layouts for controlling CueMix FX. When you load them into TouchOSC, your iPad becomes a customized Wi-Fi control surface for CueMix FX. When you purchase a MOTU audio interface, you enjoy lasting performance and value, along with the very latest cutting edge technology. Through software and driver innovations like this, we are often able to extend new technologies to a MOTU audio interface you purchased years ago, to bring extra value to your MOTU investment. For more infomation from MOTU and to download the updates click here. 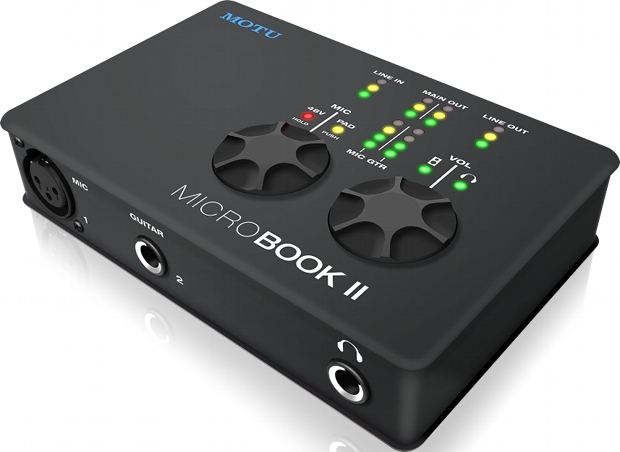 MOTU this sping will be introducing the MicroBook II which promises to be an updated version of the original compact, studio-grade audio interface. The MOTU Microbook II turns your Mac or PC into a personal 4 x 6 recording studio with professional I/O and monitor mixing. The MicroBook II is a highly portable unit and comes in a small, rugged cast metal case suitable for on-the-go recording & laptop-based DJ-ing as well as many other recording and playback activities. The four inputs (mic, hi-Z guitar, and stereo balanced line in) can be recorded simultaneously. The mic preamp delivers neutral coloration and pristine sound, with 20 dB pad and 48V phantom power for condenser mics. The MicroBook II also includes balanced analog connectors and digitally controlled analog trim. Input trim is controlled separately from input mix volume, so that users never have to sacrifice sound quality for a balanced mix. On the output side of things the MOTU MicroBook II provides six channels of computer output on eight physical outputs (four pairs) with balanced TRS quarter-inch main outs, stereo “mini” line out, S/PDIF digital out, and phones (on a stereo quarter-inch jack). The S/PDIF digital output always mirrors the main outs. Internal CueMix™ mixing and routing features let users program a different stereo mix for each output pair, consisting of any combination of live inputs and host audio tracks. Alternately, users can send the same mix to multiple outputs, or choose a separate output for the MicroBook’s built-in test tone generator or white and pink noise generator. The driver provides an extra input and output pair for routing complete mixes back to the computer host, for scoping audio streams with the analysis tools in the included CueMix FX software, and for routing virtual instrument (or other host) output to the MicroBook II mixer. On-board effects include modeled analog EQ and compression, which can be applied with near-zero latency (in the hardware) to live inputs. At only 5.5 x 3.5 x 1.25 inches, the bus-powered MicroBook II has all the great features of the original model, plus hands-on volume control and USB 2.0 connectivity for low-latency performance. 4-input, 6-output bus-powered “plug-and-play” USB 2.0 audio interface for Mac and Windows. 6 x 8 physical input/output channels. 8-bus digital mixer to route and mix live inputs with computer tracks. Pre-amp equipped mic input with Precision Digital Trim™ 48V phantom power, and 20 dB pad. Hi-Z guitar input with Precision Digital Trim. Stereo eighth-inch “mini” line level out. Headphones output on quarter-inch stereo jack with independent volume control. Output volume digital rotary encoder. Push to cycle among three modes: main out, phones, or both. Mic input digital rotary encoder for adjusting trim level, 48V and pad. Dedicated 3- or 4-segment LED meters for all inputs and outputs. CueMix™ FX no-latency mixing and monitoring with EQ and dynamics processing. Support for recording and playback at 2x sample rates (88.2 and 96 kHz). Advanced audio analysis software tools, including FFT display, spectrogram “waterfall” display, oscilloscope, X-Y plot, and phase torch. Industry standard Mac and Windows audio drivers (Core Audio, Wave, and ASIO) for across-the-board compatibility. Includes AudioDesk DAW software, USB cable, and mic cable adapter.